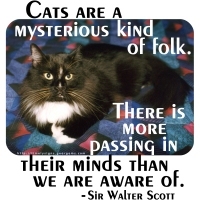 We’ve decided to use this quote by Sir Walter Scott to caption this great photo of Luigi, our late handsome (and very beloved) longhaired tuxedo cat, looking appropriately inscrutable. This design is sure to appeal to any cat lover n your gift list! Buy it now on a t-shirt, keepsake box, tote bag or other apparel or fine giftware item, exclusively from GearGems.